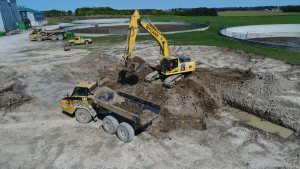 We offer a modern heavy equipment fleet which includes excavators, bulldozers, articulated rock trucks, and compactors. Range in size from 5 tonne to 40 tonne with digging depths of up to 25’. Units with zero turn capabilities – ideal for working in tight locations. Unit with rubber tracks for causing minimal damage while working on existing hard surfaces. Range in size from 10 tonne to 50 tonne. Units equipped with GPS technology making them optimal for highly influenced grading projects. Units with 6 way blade configurations necessary for grading of floors, parking lots, and roadways. McCann Redi-Mix operates modern mechanic, welding and paint shops with licensed employees in order to keep all equipment and projects running efficiently.